Over time the forces of nature cause wooden decks and fences to become weathered and unattractive. This weathering often consists not only of fading or graying from the sun but also of build up of dirt or unsightly molds, mildew or algae that can be slippery and very unsafe. Pressure washing of your exterior wood includes the removal of these elements as well as old sealants and stains or excess surface wax on new wood. This process includes restoring 100% of the visible wood from every angle leaving you with a natural new looking deck or fence that has been restored to its original golden pine color and condition. This also enables protective finishes (i.e. sealants and stains) to penetrate and adhere to the wood properly in order provide maximum protection. Pricing for this particular service starts at 50 cents per square foot. We only charge for the flat bottom and stairs while restoring all rails, pickets, sideboards and support beams free of charge. An average size deck in our area generally measures 12' by 20' and carries a price tag of $125.00. 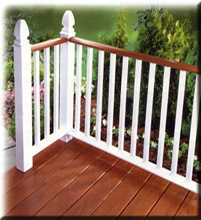 Without the application of a sealant or stain your deck or fence is under constant attack from the forces or nature. Harmful rays from the sun cause wood to fade, looking gray and weathered. Moisture from punishing rain and snow, as well as morning dew, is quickly absorbed by unprotected wood causing it to swell. The sun then dries the wood causing it to shrink. These cycles of wet and dry, swelling and shrinking, and temperature extremes promotes growth of mold and mildew and causes wood to warp, split and crack leaving your deck discolored and very unattractive. Left unprotected, any deck will be damaged by these conditions. 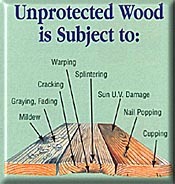 For this reason protective finishes are strongly recommended for all exterior wood. Precision Pressure Wash uses sealants and stains made by the Wolman manufacturer that carry a two-year guarantee to bead water and protect. Wolmanized lumber is a familiar term to most people due to the fact that Wolman handles 90% of all of the pressure treating of the lumber in the entire U.S. These products are amongst the absolute best offering the most extensive guarantee on the market as well as unsurpassed protection. This guarantee is not only backed by Wolman but also by Precision Pressure Wash. When it comes to protective finishes, most customers choose a clear sealant. Customers who like the natural look of new wood and also wish to remain cost effective use clear sealants as opposed to more expensive stains. These sealants are totally clear, mildew-resistant water repellants designed to protect wood from damage caused by water absorption while still allowing wood to gray naturally. All Wolman products exceed the federal specifications for water repellency. Pricing for the application of a clear sealant is 50 cents per square foot or in most cases $125.00 per deck. Customers who wish to further protect as well as beautify their decks often use an oil-based stain to achieve their desired results. Using Wolman F&P Premium Wood Finish and Preservative we are able to guarantee protection from all of nature's damaging elements for up to four years. This product is a high performance, durable, deep penetrating exterior wood finish, which provides exceptional water repellency and UV protection, plus the added protection of an EPA-registered preservative, which prevents fungal growth on the wood surface. The preservative in F&P protects against the outbreak of mold, mildew, rot and decay, even in humid, well shaded or consistently wet areas. F&P's powerful water repellant exceeds federal specification and contains the most advanced UV absorbers and UV blocking technology available today. Together, they prevent premature color fading and graying while beautifying your deck with a vividly colored yet transparent finish. These products are offered in a variety of shades to suit the needs of most consumers. Pricing for theses products and their application is based on square footage and starts at $1.75 per square foot.